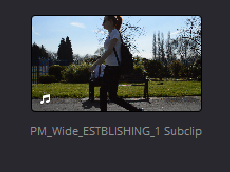 Following on from creating subclips, a really helpful little tip can be to have a different ‘Poster Frame’ for each of the clips you have in your bins. 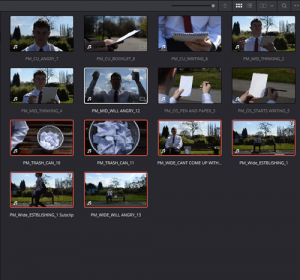 The ‘Poster Frame’ is the default frame chosen by Resolve for the icon of each clip in your project. Well, if you scrub over the icon in the bin to get to the right place where a representative frame shows, right-click and choose ‘Set Poster Frame’. 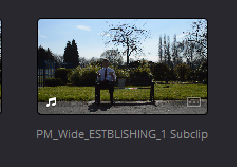 Then, when you don’t have that clip selected, it will default to your ‘Poster Frame’ view. 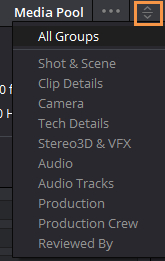 Now that we have our subclip – or any clip – selected we can view and add metadata through the ‘Metadata Panel’ (turned on and off in the Media, Edit and Fairlight pages top Right). The problem with the default view is that you can’t change anything in it! If you want to add data you need to change the view to show editable fields for adding data. This is done by clicking on the little up and down arrow at the top of the panel RHS. 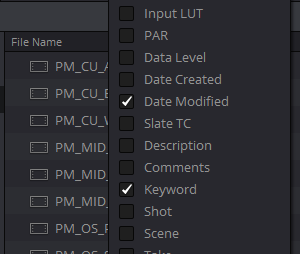 By choosing ‘Shot and Scene’ for example you get a whole bunch of editable fields (if you want to see it full height, click the word ‘Audio’ at the top to close the Audio Panel and make the metadata panel full height). Now, if you want to add additional data to a single clip, select that clip and add the data in the metadata panel. The data is added. 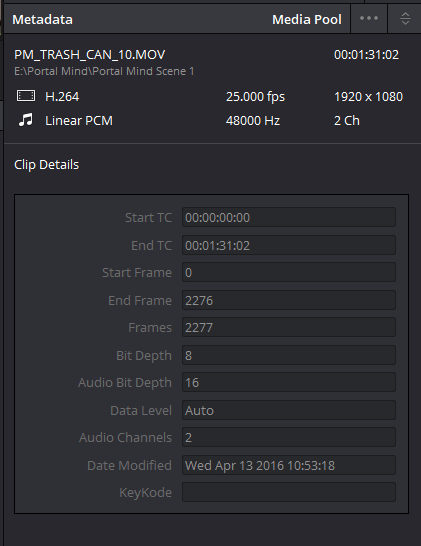 However, if you want to add this data to MULTIPLE clips at the same time the workflow is slightly different. 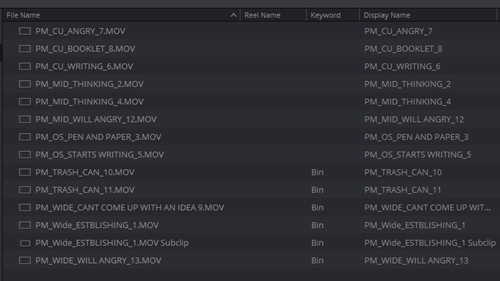 Firstly, select all the clips you wish to add that metadata to. 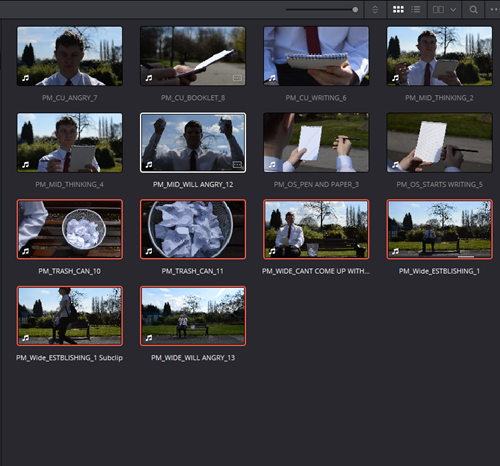 So, for example, I may want to tag all the shots that have the waste bin visible in them with the keyword ‘Bin’. Now in the ‘Keywords’ Field I can add the word ‘Bin’ and once I hit return, a check mark shows that this field is active – HOWEVER – this WILL NOT BE APPLIED until I hit the ‘Save’ button at the bottom of the panel. 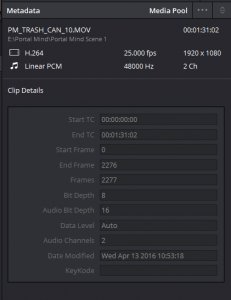 For multiple clips you must save the metadata you add. You can add as many keywords as is appropriate to your clips, although for each new selection and addition you will have to hit save if there are multiple clips. If I want to see this added data I can move to ‘List View’ and right-click in the header part (say over the word ‘File Name’ at the top LHS) and select ‘Keyword’ from the list that appears. The ‘Keyword’ Field has been added but it is usually not seen as it normally adds to the far RHS of the display. There is a small scroll bar at the bottom of the screen which will allow you to scroll across to see the new column. You can also click, hold and drag on the top name of a column to change its position in the list – say, in this instance, to move it over to the left by the ‘Display Name’.